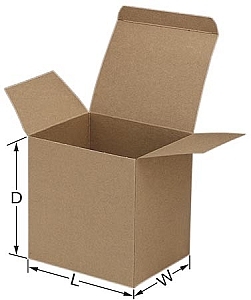 Heavy Duty Chipboard cartons, Reverse tuck box, Riverside Paper Co.
Our Heavy Duty Chipboard boxes are made from very sturdy .028 or .036 Kraft chipboard. Ideally suited for hardware, nuts and bolts and other heavier items. Folding Chipboard Boxes can be custom made to fit your specific requirements. We offer custom printed chipboard boxes in many styles. 2-3/4 x 2 x 4"
2-7/8 x 1-1/4 x 4-3/8"
2-7/8 x 1-1/2 x 5-5/16"
2-7/8 x 2-7/8 x 2-15/16"
3-3/8 x 33-3/8 x 3-7/8"